I recently picked up The Hall of Nearly Great, an exemplary collection of 43 essays about players that deserve fan attention and respect, even if they fall short of Cooperstown itself. 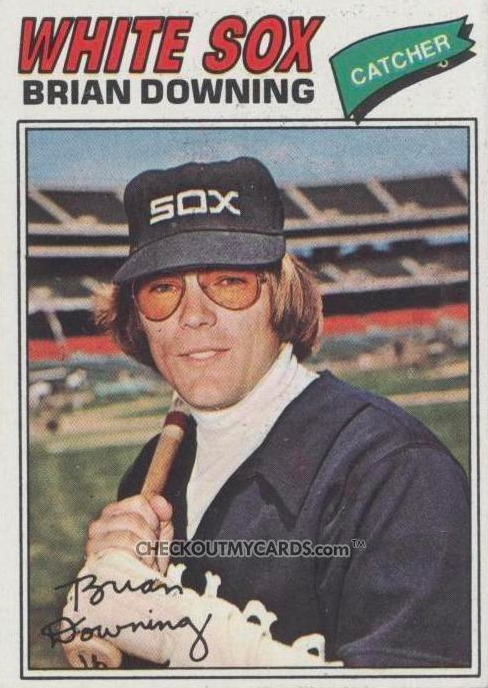 The chapter on Brian Downing mentions (without showing) this particular card, a shame considering its deft portrait of the disco decade. Note the hand cast, mock turtleneck warmup jersey, tinted glasses, and off-kilter background. That's 70s Topps, baby! Full disclosure: I can respect Brian Downing, but I hated Brian Downing. Boy, did I hate Brian Downing and his taste for Kingdome's Astroturf power alleys. It was bad enough to watch the 1980s Mariners lose so many games, but giving up extra base hit after extra base hit to someone with a softball name like Downing? Why Seattle never begged, borrowed, or stole Brian from his California employers is beyond me. Downing made it easy on modern analysis by playing 86 times in the Kingdome, just over one season of "home" games. Those (incredible) stats: 89 hits (30 for extra bases), .989 OPS, and 148 OPS+ (career stadium splits). Add in other stadiums and he still thumped Seattle for 131 OPS+, 9 points higher than any other team. In other words, it wasn't my youthful imagination that made Downing seem like Thor, God of Thunder. He really did become Manny Ramirez for those 86 games (career OPS leaders). Otherwise, Brian ranks with Dean Palmer and Al Oliver--good, but nowhere near an all-timer. Give Seattle that kind of performance from 1978 to 1992--Downing's career with AL West rivals California and Texas--and you'd see a measurable change in the standings. UPDATE: Turns out OPC did use this close-in composition for their set. Check it at Oh My O-Pee-Chee's post on Mr. Downing. Brian Downing means more to collectors than my childhood angst. This proof from a 1989 Topps Archives auction shows they considered cropping his card to a version without the wrist cast. Not sure why they stuck with the wider shot, but who knows? Everything in the 1970s pales compared to Oscar Gamble's afro. Pick up The Hall of Nearly Great ($12, PDF) for Brian Downing and 42 other profiles by baseball's best writers. Use that link and $3 goes to me as an affiliate (and thanks in advance if you do). Highly recommended reading, no matter the source!